Daphne Joy is happy spring has sprung. And to prove how she is excited about the warmer months, the model shared two new photos to her Instagram account where she was in a bathing suit while enjoying a dreamy vacation in Bali. ‘Can’t tell if this is my color or not but I’m gonna go with it,’ said the ex-girlfriend of Jason Derulo and 50 Cent. She also let her 1.3m Instagram followers know that she had some laser removal done to her body. The pinup revealed she had been to the Flawless Laser Center. The center gets rid of leg, arm hair as well as bikini lines. Joy was showing off her very muscular legs as well which she credits to light jogging and yoga sessions. The stunner wore her long, brunette tresses down. And the social media savvy star also wore flattering pink toned makeup that made the most of her photogenic face. Joy came to fame as an internet sensation. She has appeared on the covers of Smooth Magazine, BlackMen Magazine and SHOW Magazine, among others. And the star – whose full name is Daphne Joy Cervantes Narvaez – has also been featured in Ed Hardy Swim Campaign 2009 and King Magazine. This is not the first time she has been seen in Bali. The curvaceous star also flaunted her fabulous figure while in a park. She proudly showed off her figure in a royal blue dress from Fashion Nova, the same company Blac Chyna models for. And she also looked stunning as she wore a white suit while sitting outdoors with her coconut drink. The Philippines-born stunner has enjoyed a series of high-profile romances over the last few years. 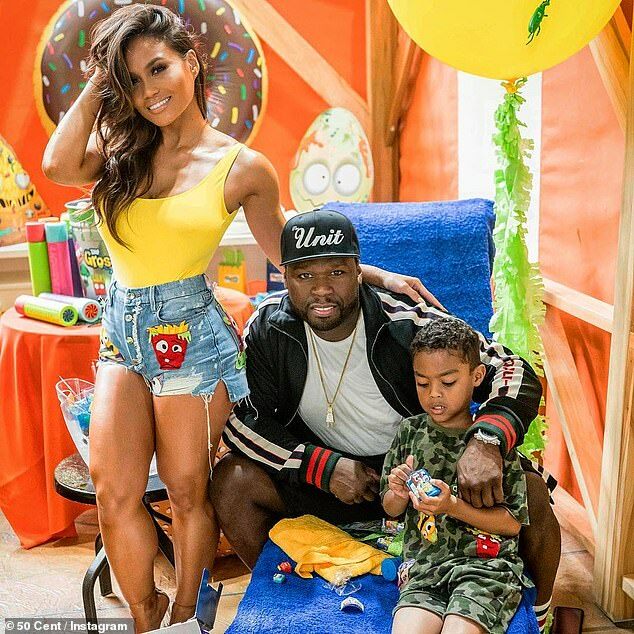 The mother-of-one shares her only child Sire Jackson, five, with rapper 50 Cent. Sire secured a $700,000 modelling contract at the age of two when he became the face of headphone brand Kidz Safe. Daphne also enjoyed a brief romance with Jason Derulo but they decided to part ways for good in May 2016. During their seven-month love affair, the lovebirds jetted off to Mexico where they were seen packing on the PDA on the beach.